only ⅜" (7 mm) thin when closed! I was tired of my small tri-fold wallet taking up so much room in my purse. My husband has used a Big Skinny wallet for several years, so I thought it was time for me to try one. 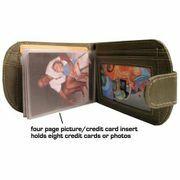 (Time ti ditch the designer wallet!) There has been an adjustment period, but I am liking it more as I use it. Everything fits in it easily. 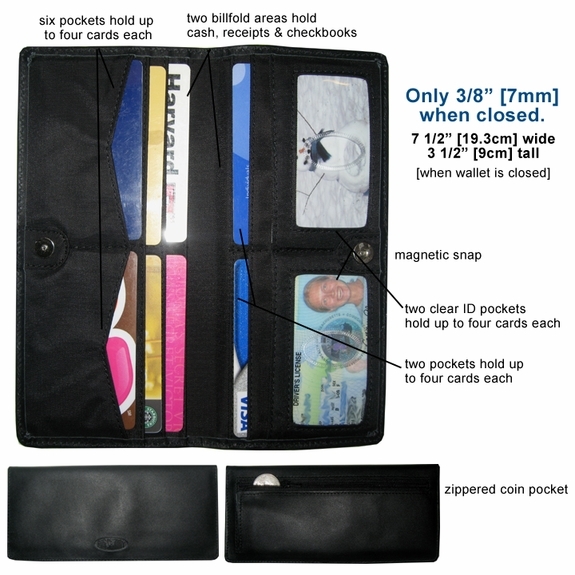 With it being a bi-fold, it's quicker access to my wallet contents. It's nice that it will accommodate a checkbook, but I've gotten used to not carrying one any longer. I just wish it came in a color that went with my Michael Kors & Coach purses. Oh well, maybe I'll buy a different color purse! I purchased the red leather check book wallett several years ago at a craft shoe and it has been the best wallet ever. It wears like iron,has so many places to store what I need to and never feels bulky. I really need a new one and have been holding off because I don't like the colors available and I am hoping you will bring the red one back. 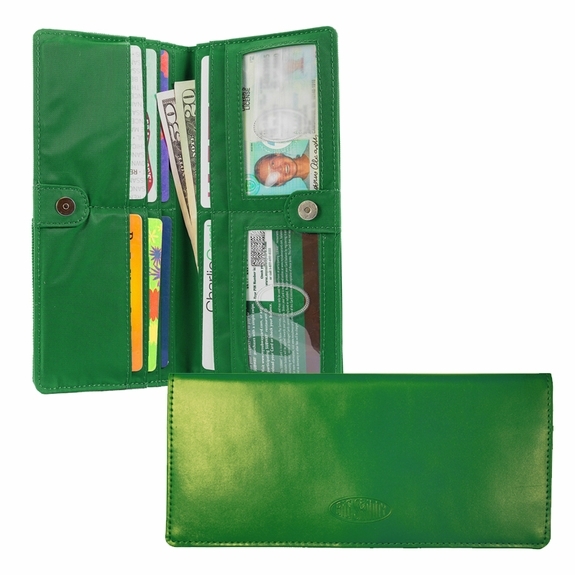 I may have to give in and order a color that I don't like simply because I love, love, love this wallet. Conscredit card slots need to be just a tiny bit wider. I loved this wallet so I purchased another one for my friend. This "skinny wallet" lives up to it's name. It is light and takes up much less room in my purse. purchased this wallet for a friend (who says she loves it too). I ordered mine on Amazon 2 years ago and it fits everything so much better than any other wallet I've used. I'm considering ordering the leather one now because the nylon traps so much dirt. If I get it wet, forget about it, water spots for life. Needless to say mine is stained and filthy. I have to side with Elizabeth here, the colors are limited and I'm hesitant to order again. Classic black will never die but that green reminds me of metal roofing or a street sign. Mine is teal and I may order that again... If you're looking for suggestions tho, how about tangerine or merlot or charcoal or olive or a metallic silver/gold. Dont forget about the weirdos who might like pastels... some people might even like yellow. Patterns are always nice too. I like the polka dots you have on some of the other wallets (navy and fuchsia?). Quatrefoil is really in right now too (that one that everyone keeps calling Moroccan). I digress. Great wallet! Leather is the way to go! But not in Kelly green! 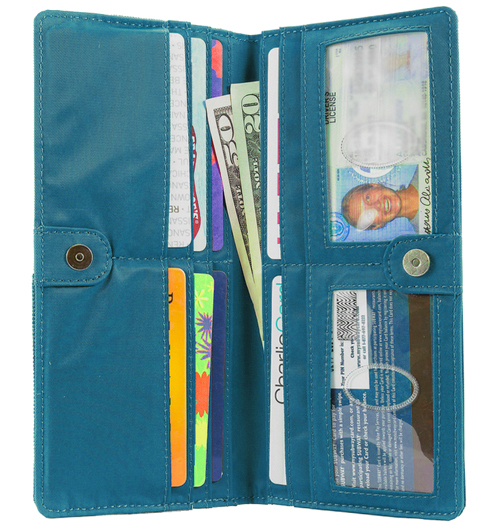 I had this wallet in the metallic blue and liked it a lot, but eventually needed to replace it due to wear. I bought a Kate Spade, but it was too bulky. So, I returned to your website intending to buy a wallet, but the color options in the leather version are not very appealing, and the big logo on the fabric version is really, really unattractive. I regret that I have to keep looking for a new wallet when your design is so good. Merchant Response:Hi Elizabeth, Thank you for your feedback :) We hope to be adding some other colors very soon :) I know we'll have a new Leather Red coming out in a few weeks. What colors would you like to see? I bought a metallic silver one several years ago. it is starting to show some wear and I would love to replace it, but the metallic isn't available anymore. It was perfect for my big handbag, I could always find it! Here's another vote to bring back the metallic silver wallet! 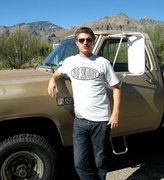 Merchant Response:Hi Elle, I loved the Metallic collection too! I'll see what I can do! I love my big skinny! I have the executive checkbook wallet and I love it! I dont have a problem with my cards falling out, and I only have a 1 or 2 in each slot. I have the metallic silver one, I wish it was still available. When mine wears out, I would like to purchase another. I have had mine 3-5 years, and its still holding up well! I can't believe how thin this wallet is with all my stuff inside it. I had a lovely Kate Spade wallet but it was so big and heavy, I just transferred everything from it into my skinny wallet and it seems to be half the size. I wanted to love the wallet. It really keeps thinner than most wallets. But I have to put 5 credit cards in each slot to keep them from just sliding out. Makes it thicker and defeats the purpose, plus it is inconvenient.